The Project – Nuevas Esperanzas was set up to tackle the issues facing vulnerable and isolated communities living close to the Telica Volcano in Nicaragua. Through offering practical and technical assistance they are helping to create a foundation for long-term sustainable development. This work includes developing infrastructure such as water systems and transport links, as well as community support, through educational programs, agricultural initiatives, health education and environmental advice. One of the greatest challenges facing the Telica hillside towns and communities is their remote location on the slopes of the active Telica volcano. The only road which links the communities to the main highway is in a terrible condition, so Nuevas Eperanzas launched the Improved Access Project to improve and extend a stretch of this road. The road will improve the communities’ quality of life by allowing better access to healthcare services, food, water, education and markets to sell their produce but also improve the safety of the residents who live with the daily threat of volcanic eruptions. 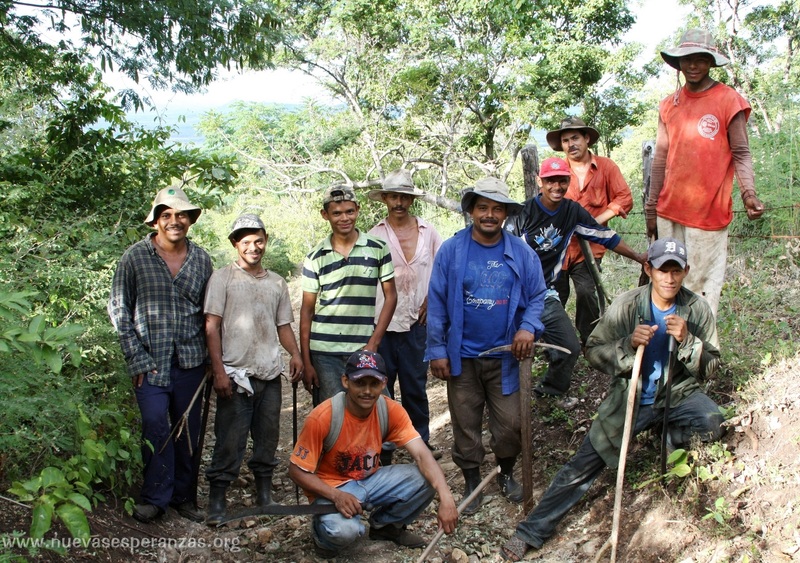 Our Support – In 2018 the LATA Foundation supported the Improved Access Project by funding the initial construction and maintenance of a 2km stretch of road linking the villages of Las Quemadas and El Caracol. With the support of the communities, the construction was completed ahead of schedule which is particularly notable given the background of violent social unrest taking place throughout Nicaragua. If additional funds can be raised, the next phase of the project will allow the road to be extended by 1,300 metres to the remote Agua Fria community, providing a lifeline for the 500 people living precariously close to the volcanic crater. In previous years the LATA Foundation has supported Nuevas Esperanzas’ Agroecology program by funding the cultivation of new crops, business management training for farmers and construction of road side kiosks from which to sell their produce. Further information – Nuevas Esperanzas has been working closely with the Telica communities for more than 10 years. Their projects initially focused on increasing access to safe drinking water through rainwater harvesting tanks and spring protection. Today, as well as water and sanitation, their projects address health, food security, education, conservation and more recently a sustainable tourism project. This project aims to develop tourism infrastructure on the volcano to benefit local people, many of whom exist on under $1 per day. Walking routes, cabins and a café have been built and local guides recently received their accreditation. A local tourism cooperative has been formed to manage activities. Visitors staying on the volcano now support these communities and have the opportunity to explore its slopes guided by those who know them best.